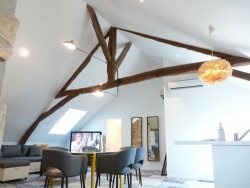 This Jewel of a Loft Style, Studio is along the Seine, directly across from Paris's Heart & Soul, the Notre Dame Cathedral & Île de la Cité. The views of the Seine, Notre Dame, the Double Pont Bridge, the Parvis (Central Square) of Notre Dame, and the thrilling Île de la Cité will take your breath away every time you gaze through the 3 sets of double paneled, double paned windows that go from one end of the studio to the other. There is a small park, café, and the famous Shakespeare & Company book store steps away, and the always active Rue Lagrange, with its food shops, bakeries and restaurants is around the corner. The romantic, covered antique book, poster, prints and antique dealers that line the Seine are directly across the street. All you need to fill your Romantic Paris Quota is steps from your Paris Haven! You'll enter the secured outer door, and then go through another secured glass door off the foyer to go directly to the elevator that will take you up 4 floors to your privileged, Paris vantage point. You'll enter the studio via a large, separated foyer, which has closets on one side, and the entrance to your Lofty Studio on the other. 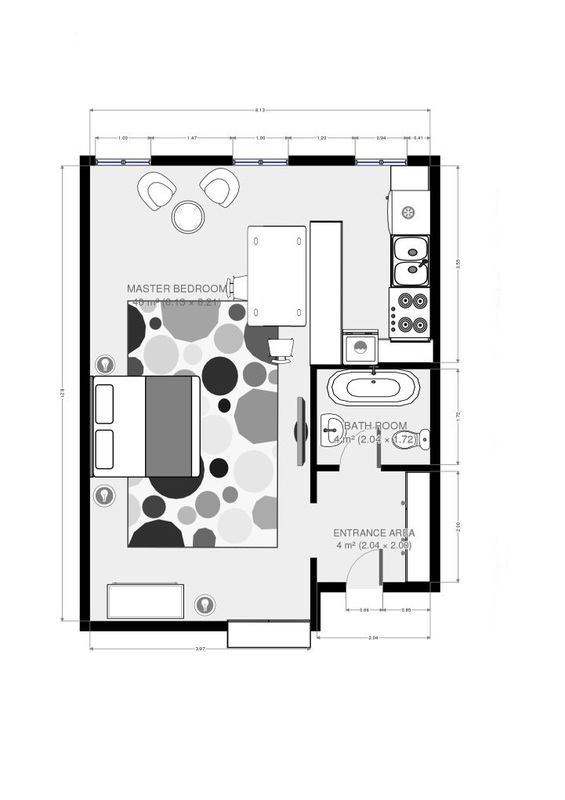 There's a mirrored glassed door to the modern and bright, bathroom directly in front of you, which is equipped with a new tub/shower, modern sink, with mirrored storage above, glass shelves on the other side, and modern toilet. Upon entering the Lofty Studio, you'll first notice the open space (350 square feet), then the light from the windows, and of course the views! There's a King bed against the back wall, with 2 night stands, with bedside lamps, and a chest of drawers with mirror that reflects the Notre Dame chiseled stones from every angle. The studio is large enough for a sitting area, with 2 arm chairs and side table, and a large dining table that can seat 4, and can be used as a desk as well. There's also another built-in closet in the main room--plenty of space for all your fashionable purchases made during the day. There's a large, flat screen TV mounted on the wall, cable channels, WiFi, Free International phones, all you need to share your adventures, and incredible pictures taken from your lodging with envious friends and family back home. The Kitchen is functional with electric stove top, microwave, drip coffee maker, toaster, electric kettle, clothes washer that also dries, and all utensils to make yourself a delicious meal when you take a rest from eating in all the wonderful restaurants and cafés in your oh-so-Parisian neighborhood.